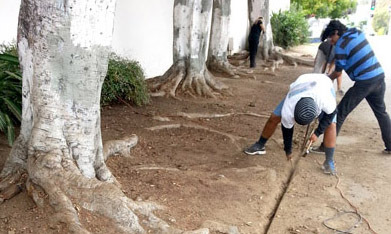 Students, faculty and alumni and an architect rolled up their sleeves recently to dig trenches and lay aluminum edging at a corner in front of Los Angeles High School. The effort was to collect water run off from sprinklers and storm water before it drains into the street and makes a muddy mess at a bus stop. STUDENTS Alan Bresnahan and Chris Navarette prepare the soil for aluminum edging. They are members of the Interact Club, sponsored by Wilshire Rotary. The problem became the impetus for a major new landscaping project at the corner of Rimpau and Olympic boulevards, said school alumni Ken Marsh. A Xeroscape-garden with rocks and drought-tolerant plants are planned to replace grass at the site. The Greater Wilshire Neighborhood Council has donated $2,000, and Wilshire Rotary paid an equal amount for supplies and plants. They will be chosen by science teacher Diane Rabinowitz, who plans an eco-system learning center at the site. “The project is a sustainable community landscape effort,” said architect Charles Cordero. Aluminum edging around the project perimeter is made of 85 percent recycled materials, he added. If more funds are secured the group of volunteers next will remove six ficus with aggressive roots and replace them with a small grove of olive trees. The project is part of the school alumni’s Rebuilding Rome plan aimed at returning some of the glory of the city’s oldest high school. A fundraising effort is underway to raise the bulk of a $300,000 proposed budget for a major beautification of the school, inside and out, said Marsh.